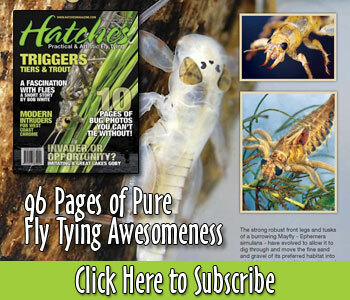 Beginning with the premiere issue in 2007 Hatches has established a new generation in fly tying publications. The 2010 issue continues the tradition of beautiful photography and features 13 unique articles that span a massive 96 pages with minimal advertising. We are now accepting pre orders for the 2010 issue which should begin shipping September 1st. The word generally means it’s time to wet-wade and fish large terrestrials to large trout. But this isn’t the case across the country; bass, carp and other species also key in on the succulent, protein-laden creatures.